Austin Wakinekona and No. 1 Saint Louis take on No. 3 Kamehameha in high school football tomorrow. A week ago, it was Punahou that had jet lag and Saint Louis that had to prepare for the first big football showdown of the Interscholastic League of Honolulu season. This weekend, newly-minted No. 1 Saint Louis holds the short week and Kamehameha has had two weeks to get ready. The Crusaders (3-0, 1-0) are coming off a resounding 40-19 win over then-No. 1 Punahou on Saturday, but the next game is lined up for tomorrow. That means Saint Louis got in three practices before yesterday's light workout. Saint Louis' defense has allowed just 49 points against Mililani, Farrington and Punahou - the latter going more than a half with rusty Cayman Shutter. In Kamehameha signal-caller Edmund Kamano Jr., the Crusaders face their toughest challenger. Third-ranked Kamehameha (3-1, 0-0) certainly has its hands full against Saint Louis' precise run-and-shoot offense, but the two weeks of prep time also gave the Warriors time to heal from injuries. Of course, it's possible that Kamehameha's view changed over the weekend. The patience and accuracy of Saint Louis quarterback Jeremy Higgins were stellar aspects of an offense that simply took what Punahou gave it. Higgins didn't throw a pick in 35 attempts, and he didn't complete a pass for more than 20 yards until his 14th toss. It was only late in the game that the junior completed a pass of more than 30 yards - a swing pass that Jordan Fukumoto turned into a tackle-breaking 38-yard touchdown, and a 85-yard bomb to speedy Billy Stutzmann. Kamehameha has faced tough quarterbacks before, but fared well. St. John Bosco passer Keith Price, who has committed to Washington, was 11-for-20 for 110 yards in a win over the Warriors. Kapolei's Noah Pascua was 13-for-26 for 115 yards. The Warriors do it with a "no-name" defense that is almost as creative and tricky as its wide-open offense. They often line up with three or even two down linemen, using linebackers to stunt at any and all angles. It's not the biggest Kamehameha defensive unit ever, but it may be the one that leads the program back to the top. While Punahou used a relatively conservative approach - not much blitzing and a lot of coverage over the middle and deep routes - Kamehameha will probably mix it up a lot more. Higgins had streaks of five and six consecutive completions in the first half. Fukumoto was targeted nine times, almost all on out patterns, and had nine catches for 119 yards. Whether Kamehameha has the speed on the outside to go 1-on-1 with Stutzmann and Lucas Gonsalves remains to be seen - by Higgins. The Crusaders are on the mend. Bulldozing running back Austin Wakinekona went down last week with a leg injury. Here's a look at more matchups tomorrow. The Mules (4-0, 2-0 Oahu Interscholastic Association Red West) were magical for a quarter against a rugged Kapolei defense last week before grinding out a 21-7 win. Andrew Manley (281 passing yards) spread the wealth to seven teammates, but it was versatile Rico Newman (seven catches, 80 yards) who got the most with 11. In his last three games, Skye Kaapuni has 22 receptions for 398 yards and three scores for Pearl City (0-5, 0-3). The Governors (4-1, 3-0 OIA Red East) rely on defense and a run-first mentality. Dayton Kealoha has thrown only one interception in 81 pass attempts. Apelu So'oalu not only runs hard (473 yards), but has kicked five field goals. Kailua (0-4, 0-3) has two losses by one point and fell last week to Kaimuki by a touchdown. The Seariders (2-2, 2-0 OIA Red West) are well-rested for this renewed rivalry game. Since returning from injury, Danny Kekoanui has rushed for 255 yards and caught 10 passes for 103 yards in three games. Nanakuli (1-3, 0-2) needs stops against the run. Waipahu gained 195 yards on the ground and Kapolei collected 166 rushing yards against the Golden Hawks. Strangely enough, pass-happy Iolani ran 21 times and threw the ball 20 in last week's 35-0 win over Word of Life. In their two meetings last fall, Iolani (4-1, 2-0 ILH) and Pac-Five split their series. The Wolfpack (2-3, 0-2) were turnover-free in a 21-14 win last October. This year's Wolfpack are an aerial circus; P.J. Minaya threw for 511 yards against Word of Life and 332 in a loss to Damien last week. Darin Kamealoha caught seven passes for 134 yards and had a team-high 14 receptions, but London Amorin (six receptions, 100 yards) and Dylan Gomez (eight catches, 92 yards) get plenty of action, too. It's a pivotal battle in the OIA Red West for the surging Marauders (4-1, 2-1) and healing Hurricanes (2-3, 1-2). Kapolei's defense will face a run-first Marauders attack led by versatile Troy Matautia. Tevita Aholelei and Justin Paderes give the Bulldogs (2-2, 1-1 OIA Red East) a potent combo at running back. Roosevelt (1-4, 0-3) gave up 289 passing yards in a 19-0 loss at Castle last week. The rested Cougars (2-2, 2-1 OIA White) haven't been tested since losing to Kalaheo three weeks ago. Aiea (2-3, 1-3) has permitted just seven points in its last two games. Moanalua (2-2, 1-2 OIA White) has come close against division contenders Radford and Campbell. Kalani (0-3, 0-3) stocked its best sophomores on the junior varsity, which has 40-plus players. 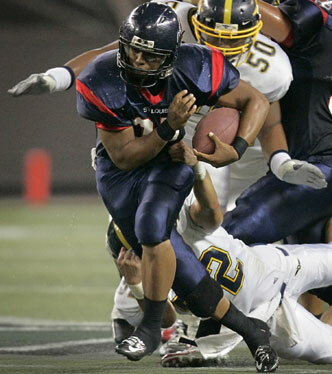 The Lunas (2-1, 1-0 MIL) appear to be the runaway favorite for the MIL's Division II title after winning at KS-Maui. Modified Wing-T quarterback Jake Manning had 123 of his team's 224 rushing yards. Shane Brostek, son of former Iolani and St. Louis Rams lineman Bern Brostek, is an anchor in the trenches for HPA (2-1, 1-1 BIIF). Brostek is a 6-foot-2, 290-pound freshman. Both teams lost close games last week. Hilo (0-3, 0-2) fell to Kealakehe 27-23 and Keaau (1-3, 1-1) lost at Honokaa 17-16. The Cougars are a title contender if penalties are held in check.